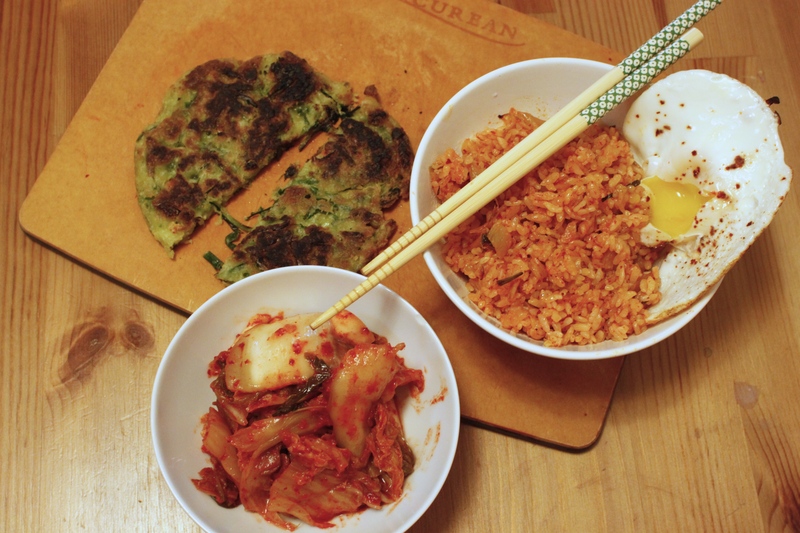 Savory Kimchi Fried Rice — Oh Wonderful! Is rice gluten-free? That was the question that came out of my mouth only hours before I made this batch of perfect Kimchi Fried Rice. It’s the perfect dish to whip up in less than 20 minutes and can easily be made vegan, vegetarian, or mixed with marinated meat. I’m sure you’ve heard this before, but you have to, have to, have to use leftover rice. I prefer to pull it right out of the freezer and let it defrost straight in the pan with the chopped kimchi. This is incredibly quick Kimchi Fried Rice, and I mean quick. 5 minutes of prep, 10 minutes of cooking, 5 minutes of eating. It is great. 1. In a pan on medium heat, saute kimchi in sesame oil until slightly soft. Toss in frozen rice and defrost as kimchi cooks or for about 8 minutes. 2. Once rice is defrosted, continue to saute with soy sauce and a bit of gochugaru. 3. Set aside rice in a separate bowl. In the same pan, crack the egg and season with salt and pepper. Cook the egg sunny-side up so that when you serve the rice, you can rip the yolk open for some of that chewy, buttery smooth flavor to complement the sharp Kimchi.